The first part of this understanding is now covered in I28. Please read that page first. The second part of this understanding is now covered in I29. Please read that page second, then continue below. 12 'Look! I am coming quickly, and the reward I give is with me, to render to each one as his work is. 13 I am the Alpha and the Omega, the first and the last, the beginning and the end. (Revelation 22 NWT). There are 24 letters in the Greek alphabet between alpha and omega (counting inclusively). So Jesus is the first and the 24th in some sense to do with giving rewards and rendering to each one as his work is. This is of course salvation or not. So there are 24 salvation covenants and Jesus mediates the first one made, the Angelic Ransom Covenant and the last one made, the Ark Rapture Covenant. Jared was resurrected into Eden2 under the AFC in an Enochian body. The human bodies of the non adamics possessed by Michael ransom faith covenant mediators (following after the pattern of Jesus himself). The human bodies of the non adamics possessed by Gabriel ransom church covenant mediators (following after the pattern of Methuselah). The angelic bodies of the non adamics possessed by Michael ransom angelic covenant mediators (following after the pattern of Jesus himself). The AFC lasts until the SFC is validated. The SFC lasts until the 1AC is validated. So a resurrection is always available to a saint after Enoch's ransom of Abel - see U54. One is resurrected in progression up the covenant tree. So the first human resurrection is into the faith system covenant or church system covenant, then into the sealing covenant. All the resurrections described in the bible were into non adamic ageing bodies and therefore into testing covenants not sealing covenants (FRC, CRC, ARC). Being baptised into the ICC does not give you salvation but is a necessary step towards salvation which comes from the sealing covenant the CRC. Likewise being resurrected into an ICC body (which is actually a non adamic version of your own body zapped by the genes of the validation sacrifice for the ICC which was the human body of John the baptist), does not actually improve your health or longevity in any way. But it is a necessary step towards indefinite non ageing life which comes from the Methuselaian body of the CRC. Non adamic bodies do not help those who possess them. They are all used as ransoms for other people. The first thing we see from the table above is that Enoch was transferred before died. This was in order that Jared did not have to spend more than the statutory minimum time asleep in the first death (just over one night presumably). 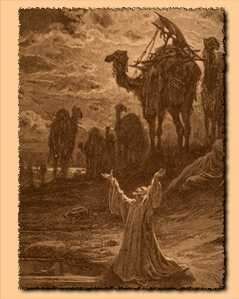 For Abel and Seth were were ransomed by Enoch's human body in 3040BC when Enoch was transferred so as not to see death. Enoch was transferred so as not to see death into his angelic body aged 365. Then 30 years later he was again transferred so as not to see death into Seth's angel body. Because Seth would have been born again in Eden2 after 30 years. Then Enoch ransomed Seth angelically - in other words Enoch and Seth performed an angelic swap. Jared and Methuselah were both resurrected into Abelian/Enochian bodies after they died. Later Methuselah was gene zapped into a Melchizedaic body and Melchizedek (who became Melchizedek - meaning King of Righteousness - upon his resurrection to become the King of Eden2 which he fathered) was gene zapped into a Methuselaian body. Shem was born in 2469BC before the flood and so was resurrected into an Abelian body. Then later he was ransomed into an Isaac body. Isaac was resurrected into a Pelegian body ransomed by Eber when he died. Presumably Isaac then gave his angel to Nahor for the NAC. 5 For one God, one also [a] mediator of God and of men, [a] man, [a] Christ, Jesus. The literal meaning of this wonderful piece of scriptural ambiguity is. 5 For one God [there is], one [God] [who is] also a mediator of Jehovah and of men, [a] man, [a] Christ, Jesus. 5 For one God [there was before the flood], also one mediator of God and of men, a man [Melchizedek]. 5 For one God [there was after the flood and before Jesus], and one mediator of God and mediator of men [i.e. a mediator for priests] [during that period], a Christ [Methuselah - who was possessed by the angel Gabriel, a hybrid, not merely a man]. For Adam was the first human priest. It was through him that mankind, pre-adamic mankind, learned about God. This Master Covenant for the ransomer we call the FRC and the blessing covenant for the ransomee we call the FBC. Melchizedek was Jared, the father of Enoch - U506. Melchizedek had no need to ransom the pre-adamics, they were not under Adam's death penalty. Melchizedek (his name in the peri-flood system) started life as Jared in the pre flood system - U506. Jared fathered Enoch who fathered Methuselah. 45 It is even so written: The first man Adam became a living soul. The last Adam became a life-giving spirit (1 Corinthians 15). So if Jesus is the last Adam then Adam was the first Jesus. This master ransom covenant for Gabriel/Methuselah we call the CRC and the blessing covenant of the ransomee (Noah) we call the CBC, the Church Blessing Covenant. Plainly Noah is the father of those saved by water, having saved our entire species in that manner himself. 5 and he did not hold back from punishing an ancient world, but preserved [the] eighth [one], Noah, a preacher of righteousness, when he brought a deluge upon a world of ungodly people (2 Peter 2). 26 And to Seth also there was born a son and he proceeded to call his name Enosh. At that time a start was made of calling on the name of Jehovah (Genesis 4). 32 And it must occur that everyone who calls on the name of Jehovah will get away safe; for in Mount Zion and in Jerusalem there will prove to be the escaped ones, just as Jehovah has said, and in among the survivors, whom Jehovah is calling (Joel 2). 29 And he proceeded to call his name Noah, saying: This one will bring us comfort from our work and from the toil of our hands resulting from the ground which Jehovah has cursed (Genesis 5). This comfort comes with the paradise of the kingdom of God, the second Eden, the Sabbath over which Jesus is Lord. So Noah is the father of water baptism, the ransomee of Methuselah. In fact all humans today have two genetic fathers, Adam and Noah. And these two are also covenant fathers one of the spirit baptised and the faithful and the other of the water baptised. Gabriel did not die as an angel in this ransom, but his first human host (Methuselah) died, with Gabriel inside him at the time (we think), in the year of the flood, 2371BC. He would have died during the 40 days of rain of the flood itself, between 2371Heshvan17 and 2371Chislev27. Methuselah was non adamic - U506. He would not have died judicially during the flood, he was not in need of any judicial execution by God. The sons of the CRC have all been in a true religion, they are all priests as Noah was, the get their edenic human bodies courtesy of Gabriel through Methuselah's body, the longest living human to date (he lived 969 years). Furthermore there has never been more water around than in the flood and the CRC is entered through 'water' baptism. In fact, lets reboot our brains shall we? Why is it that entry to the ICC is through water baptism? True a bath cleans away physical dirt from the past which symbolises fleshly sins committed in the past. But surely all water baptisms point back to the flood? Surely Methuselah died by the waters of the flood so that we might live through the waters of the Jordan, the bath of the flesh. This master ransom covenant we call the Angelic Ransom Covenant (the ARC) and its blessing covenant for Adam, we call the ABC. In all three covenant explanations above, and in many places in this website and in the bible, 'sons' means 'sons and daughters'. The three master covenants above were made after Satan sinned and so were made directly with God, without the Firstborn Master Covenant, which Satan lost when he sinned. But after Jesus' death, any new covenant made with God, must be made through Jesus, since he then became God's firstborn taking the firstborn right which is to have the Firstborn Master Covenant which stipulates that God must do everything through the firstborn. Melchizedek's ransom provides a non ageing human soul for adamic sons of faith who hold a reasonably good conscience in the new system. The blessing of the FRC is a human resurrection into the Kingdom of God with a perfect edenic body. Methuselah's ransom provides a non ageing human soul for adam's sons in the new system. The blessing of this covenant of water baptism is that one is a priest in this system (if male), and one is a priest in the next system (whether male or female). For obeying the law provided entry into the CRC as we shall see, so every Jew with faith, would have evangelised about his God and could take people into his household and have them circumcised as proselytes. Furthermore since one is a friend of the groom, one is invited to the marriage of the lamb in heaven after Armageddon. So one is resurrected in time to see both Armageddon and this marriage. Then one gets a human resurrection into the Kingdom of God with a perfect edenic body. From a salvation standpoint, the FRC and the CRC provide the same blessing. But they provide it to different groups and the CRC is a priestly covenant, a covenant for those in the true religion. A priesthood is a non genetic fathering, by providing entrance into a salvation covenant. Michael's ransom provides an everlasting angelic body for Adam's sons in the new system. If Methuselah's/Gabriel's ransom is applied during the Kingdom, which is the same statement as, if Noah is resurrected into the Kingdom of God and since the first will be last, he must be so resurrected, then those in Gehenna will not benefit from this ransom, being under the second death, and so are not entitled to any body (human or angelic) at the time the ransom is carried out. This appears to mean that all those in Gehenna can never be humans again! At least not in the human form of Adam. But they can be angels again through the ARC - U13a, and possibly humans in the form we take after the Kingdom of God. Technical Note: If Abraham's ransom by the human soul of Jesus, which we look at later, was applied today, then all of his genetic descendants as well as all those in the 1AC would be resurrected (other than those in Gehenna). Gehenna is the means which prevents resurrection when ransoms are applied. Likewise when Adam is finally ransomed and thereby resurrected, all of his genetic and covenant descendents who are not in Gehenna, are resurrected. This is why he is resurrected last after his sons. The next part of this section is covered in I29. Please read that page first, then continue below. What form of faith is acceptable for the 1AC? 6 And he put faith in Jehovah, and he proceeded to count it to him as righteousness (Genesis 15). 35 but in every nation the man that fears him and works righteousness is acceptable to him (Acts 10). Abraham put faith in a being whose name means: He who causes to become. So his sons must put faith in a being who they believe to be their creator, but this being does not have to be Jehovah himself. So for example: faithful Hindus who believe in Brahman who is a three in one God embodying a creator, a preserver and a destroyer do qualify for the 1AC. Likewise the Buddhists believe in Brahma, the supreme Deva, a God and a creator. There appear to be a few religions, such as those of some American Indian tribes, which worshipped animals and had no creator. However the neighbouring tribes may have had a divine creator in their belief system and so enabled a salvation through the 1AC for some more spiritually adventurous members of the tribe without such a belief system. Most people are aware of a few other belief systems in addition to their own. Taoism, the main religion of China, appears to deny a divine creating being. So it may be useless as regards entry to the 1AC. However many of those who are believers in Taoism may personally believe in a divine creative being! Many followers of false religions and of true religions do not believe every church doctrine. So anyone who believes in a creating being is eligible to be a son of Abraham through his main covenant. Those of this group who act on true faith by joining the true congregation of God, which is the congregation of those who have gained entry to ICC, promised to Abraham's seed in the 2AC, are the sons of Isaac. They attain righteousness in the flesh through abstaining from bad works according to the rules of the true congregation. Those in the 1AC or in the 2AC can then go on to attain the second happiness of David, which is to have a clean conscience, to have all ones sins forgiven until time indefinite. Such people are born again and have gained entry into JAC, promised to Abraham's seed in the 3AC. These then are the sons of Jacob by covenant and the sons of Jesus the eternal father through the ARC. Just as Melchizedek presides over the entry of Gabriel into his host, who then presides over the entry of Michael into his host - U506 (although once, the first time, it went Melchizedek Michael Gabriel as it sometimes does with the FRC the ARC and the CRC), so Melchizedek mediated the master covenant of faith (FRC) and he provides entry to the true Christian congregation, who are the beneficiaries of the ransom of Gabriel, the master mediator of the covenant for all true religions (the CRC), through the main covenant of the second blessing of Abraham (the 2AC). And the Christian congregation provides entry into God's family by being born again and gaining a new angelic body as a host for the spirit, this being the blessing of the 3AC, through the JAC, thanks to the ransom of Michael under the ARC. So this really is the largest understanding that the LWs have at this time. The prophetic drama enacted by Melchizedek, Gabriel and Michael, each time the three of them appear, is symbolically describing the detail of God's legal plan for man's salvation through the FRC, the CRC and the ARC or for those in the post Abrahamic system through the 1AC, the 2AC and the 3AC respectively. For example it was Simeon, who was Melchizedek, who presided over the entry of Gabriel into John the Baptist, and it was Gabriel in John's body who presided over the entrance of Michael into Jesus' body at his baptism - U506. 25 And, look! there was a man in Jerusalem named Simeon, and this man was righteous and reverent, waiting for Israel's consolation, and holy spirit was upon him. 26 Furthermore, it had been divinely revealed to him by the holy spirit that he would not see death before he had seen the Christ of Jehovah. 28 he himself received it into his arms and blessed God and said... (Luke 2). Whereas Melchizedek said: Blessed be the most high God (Genesis 14:20). 15 because all the land at which you are looking, to you [Abram and his sons] and [then] to your seed [Isaac, then Jacob - each new seed being defined by an LCC covenant] I am going to give it until time indefinite. 16 And I will constitute your seed [Isaac and his sons, then Jacob and his sons] like the dust particles of the earth, so that, if a man could be able to count the dust particles of the earth, then your seed could be numbered. 17 Get up, go about in the land through its length and through its breadth, because to you I am going to give it (Genesis 13). In the word symbolism, another seed becomes the greater dust particles (Edenic dust particles) and gets the same land (in the Kingdom of God). In the Kingdom of God one can see north, south, east and west, all over the whole planet! The promised land is not given to Jesus during this system, but it ceases belonging to the sons of Jacob when the LCC ends. 17 The sun was now setting and a dense darkness came and, look! A smoking furnace and a fiery torch that passed in between these pieces. 18 On that day Jehovah cut/concluded/made/ratified/validated with Abram a covenant, saying: To your seed [Isaac and his sons] I will give this land (#ra), from the river of Egypt to the great river, the river Euphrates. 21 and the Amorites and the Canaanites and the Girgashites and the Jebusites (Genesis 15). 1 When Jehovah your God at last brings you into the land to which you are going so as to take possession of it, he must also clear away populous nations from before you, the Hittites and the Girgashites and the Amorites and the Canaanites and the Perizzites and the Hivites and the Jebusites, seven nations more populous and mighty than you are (Deuteronomy 7). 7 At this the men of Israel said to the Hivites: Perhaps it is in our vicinity that you are dwelling. So how could we conclude a covenant with you? 15 And Joshua went making peace with them and concluding a covenant with them to let them live, and so the chieftains of the assembly swore to them. 17 Then the sons of Israel pulled out and came to their cities on the third day, and their cities were Gibeon and Chephirah and Beeroth and Kiriath-jearim (Joshua 9). 23 And now you are cursed people, and a slave's position and being gatherers of wood and drawers of water for the house of my God will never be cut off from you (Joshua 9). 6 Meanwhile Saul said to the Kenites: Go depart, go down from the midst of the Amalekites, that I may not sweep you away with them. As for you, you exercised loving-kindness with all the sons of Israel at the time of their coming up out of Egypt. So the Kenites departed from the midst of Amalek (1 Samuel 15:6). 12 All the royal realm of Og in Bashan, who reigned in Ashtaroth and in Edrei he it was who remained of what was left of the Rephaim and Moses went striking them and dispossessing them (Joshua 13). So the promised land was not all the land between the Nile and the Euphrates at all, it was merely the lands occupied by the 10 nations recited in Genesis 15. These lands presumably stretched from the Nile to the Euphrates. 2 Moses my servant is dead; and now get up, cross this Jordan, you and all this people, into the land that I am giving to them, to the sons of Israel. 3 Every place upon which the sole of your foot will tread, to you people I shall certainly give it, just as I promised to Moses. 4 From the wilderness and this Lebanon to the great river, the river Euphrates, that is, all the land of the Hittites, and to the Great Sea toward the setting of the sun your territory will prove to be (Joshua 1). 4 Then to Isaac I gave Jacob and Esau. Later to Esau I gave Mount Seir to take possession of it; and Jacob and his sons went down to Egypt (Joshua 24). 17 And these are the years of Ishmael's life, 137 years. Then he expired and died and was gathered to his people. 18 And they took up tabernacling from Havilah near Shur, which is in front of Egypt, as far as Assyria. In front of all his brothers he settled down (Genesis 25). The wilderness of Shur is in the Sinai Peninsular somewhere. 'In front of' is meant in the sense of temporally before. So Ishmael settled the entire promised land before the seed of Isaac did. This settlement by Ishmael was in accordance with the LCC. But the ILLC changes things as we shall see. 15 Brothers, I speak with a human illustration: A validated covenant, though it is a man's, no one sets [it] aside or attaches additions to it (Galatians 3). The LCC was validated by God in Genesis 15, with a fiery furnace. The 1AC, which Paul is referring to by contrast was validated by Jesus and has no additions and is not set aside. Neither does the 3AC have additions, and neither is it set aside. It appears that Ishmael and Abraham's non Jacobian seed, who had the obligation to be circumcised but had no law so they got some of the greater promised land (Edom etc) but they had no earthly administration (symbolic land) and hence they could behave like wild asses. But they too were God's covenanted people and he was their God until the LCC ended. After this they mainly became Muslims it would appear. There is no point in being circumcised and being a Muslim (or indeed in being circumcised any more since that covenant has ended). 6 but who have fallen away, to revive them again to repentance, because they impale the Son of God afresh for themselves and expose him to public shame. 7 For example, the ground that drinks in the rain which often comes upon it, and that then brings forth vegetation suitable to those for whom it is also cultivated, receives in return a blessing from God. 8 But if it produces thorns and thistles, it is rejected and is near to being cursed; and it ends up with being burned (Hebrews 6). 30 He that is not on my side is against me, and he that does not gather with me scatters. 31 On this account I say to you, Every sort of sin and blasphemy will be forgiven men, but the blasphemy against the spirit will not be forgiven [conscious stealing of the glory of the spirit - this does not apply to mistaken or unconscious blasphemy as was the case with the Pharisees]. 32 For example, whoever speaks a word against the Son of man, it will be forgiven him; but whoever speaks [by his actions] against the holy spirit, it will not be forgiven him, no, not in this system of things nor in that to come [this is the one who is a part of the holy spirit being spirit sanctified, and who loses faith in his sanctification as did Ananias and Saphira]. 33 Either you people make the tree fine and its fruit fine or make the tree rotten and its fruit rotten; for by its fruit the tree is known. 34 Offspring of vipers, how can you speak good things, when you are wicked? For out of the abundance of the heart the mouth speaks (Matthew 12). [conscious stealing of the glory of the spirit - this does not apply to mistaken or unconscious blasphemy as was the case with the Pharisees]. 24 Woe to the man through whom the son of man is betrayed! It would have been finer for him if that man had not been born (Matthew 26). Judas was born from blood, i.e. sanctified, his judicial life was mediated to him, and being an apostle he had tasted the powers of the next system, the gifts of the spirit. But he deviated and was therefore consigned to the sinbin, having busted his baptism. This puts him in a worse position than the man who is unrighteous in spirit, who was never sanctified, because this man at least can attain to a fleshly resurrection into the kingdom of God. If you are sanctified and you find the true church and join it, then if you die without a water baptism, in circumstances where that church still has a water baptism, then you go to Gehenna. Because you defile your conscience being aware that you must die with a water baptism into order to complete your spirit baptism. Now since Satan can put some of his people into a spirit baptism, it is possible that some of these and other saints will not join the church at all. These ones will lose their spirit baptism but will not necessarily go to Gehenna because they do not defile their conscience if they die without a water baptism. So the sin against the holy spirit is to reject it having been sanctified, which is the height of ingratitude, and would only occur if the saint becomes terminally addicted to a sin. Such rejection is speaking against the holy spirit and impaling the Son of God again (killing his work and his ransom for themselves). Now Adam, since he did not live in the post flood system or the post fire system to come (Matthew 12:32), did not, in the mercy of God, permanently lose his judicial life when he sinned against the holy spirit, his actions in eating the fruit, were speaking against it, and amounting to a blasphemy. But nevertheless we can deduce that since he was condemned in spirit, albeit temporarily, by his sin, he would have been justified or declared righteous in spirit had he resisted his fleshly act. In fact had he done so then rather than sticking to the fleshly woman, his wife, he would have become stuck to the heavenly woman, the holy spirit, forever. 16 And Jehovah God also laid this command upon the man: From every tree of the garden you may eat to satisfaction. 17 But as for the tree of the knowledge of good and bad, you must not eat from it, for in the day you eat from it you will positively die (Genesis 2). So Adam was permitted to eat from the tree of life to satisfaction, and satisfaction as regards life is everlasting life. So had he not been evicted from the garden, then he would have continued eating from the tree of life until he was fully satisfied. This state of affairs symbolically says that the priesthood of the tree is able to give everlasting life. 11 As regards any man or woman that comes in to the king [Jesus, who seals in holy spirit and fire] at the inner courtyard [entering the church as a saint], who is not called [not yet sealed, some come in who are already sealed] his one law is to have him put to death, only in the case the king holds out to him the golden sceptre [seals him to be a king], he will also certainly stay alive (Esther 4). [Jesus, who seals in holy spirit and fire] at the inner courtyard [entering the church as a saint], who is not called [not yet sealed, some come in who are already sealed] his one law is to have him put to death, only in the case the king holds out to him the golden sceptre [seals him to be a king], he will also certainly stay alive (Esther 4). 22 Let us approach with true hearts in the full assurance of faith, having had our hearts sprinkled from a wicked conscience and our bodies bathed with clean water (Hebrews 10). 14 For if the blood of goats and bulls and the ashes of a heifer sprinkled on those who have been defiled sanctifies to the extent of cleanness of the flesh, how much more will the blood of the Christ, who through an everlasting spirit offered himself without blemish to God, cleans our consciences from dead works, that we may render sacred service to the living God. So that is why he is a mediator of a new covenant, in order that because a death has occurred, for their release by ransom from the transgressions under the former covenant, the ones who have been called might receive the promise of the everlasting inheritance (Hebrews 9). 2 and I shall make a great nation out of you and I shall bless you and I will make your name great; and prove yourself a blessing. 3 And I will bless those who bless you, and him that calls down evil upon you I shall curse, and all the families of the ground/earth (hmda) will certainly bless themselves by means of you (Genesis 12). This is an ambiguously written scripture. Obviously the �great nation� were the sons of Israel in the literal meaning. But this scripture, since the word 'land' appears twice in it, has a greater word symbolic meaning by the Symbolic Structure Principle. There is a further fulfilment of a 'great nation' out of Abraham. This is the citizens of the Kingdom of God who are saved under the 1AC. Why did God choose Abraham in particular ? What was this blessing that all the families of the ground would get through him ? The answer to the first question is seen by Abraham�s actions after he was chosen. He was a very spiritual man. When he was asked by God to kill his firstborn son Isaac, he reasoned that God could raise him from the dead so he went ahead with the request (although God stopped him at the last minute). It is important to realise that Isaac went along voluntarily out of love for God, love for his dad, and his own spiritual vision, so at the worst this was an assisted suicide. 18 although it had been said to him: What will be called 'your seed' will be through Isaac. 19 But he reckoned that God was able to raise him up even from the dead; and from there he did receive him also in an illustrative way (Hebrews 11). 10 For he was awaiting the city having real foundations, the builder and maker of which [city] is God (Hebrews 11). What is the blessing that all of the families of the ground would get from the 1AC and the Nations of the earth (the congregations of the true religious administration) will get from the 2AC ? 7 Surely you know that those who adhere to faith are the ones who are sons of Abraham. 8 Now the Scripture, seeing in advance that God would declare people of the nations righteous due to faith, declared the good news beforehand to Abraham, namely: By means of you all the nations will be blessed (Galatians 3). 14 The purpose was that the blessing of Abraham might come to be by means of Jesus Christ for the nations, that we might receive the promised spirit through our faith (Galatians 3). The blessing of Abraham is the resurrection into the Kingdom of God on earth through the 1AC and the FRC. 8 But Zacchaeus stood up and said to the Lord: Look! The half of my belongings, Lord, I am giving to the poor, and whatever I extorted from anyone by false accusation I am restoring fourfold. 9 At this Jesus said to him: This day salvation has come to this house, because he also is a son of Abraham (Luke 19). He was a son of Abraham physically before the day when he gave half of his belongings to the poor. He could not have become again a son of the Second Abrahamic Covenant by repenting and obeying the law of Moses, since the law lost water baptism power in 25Tishri. So his salvation was that he completed his test of faith under the 1AC. So being a party to the First Abrahamic Covenant (1AC) means that you gain salvation, which means that you have (an unofficial from a true religion standpoint) visa to enter the Kingdom of God, which means that either you will be resurrected into it if you die before Armageddon, or you will survive Armageddon. 29 Moreover, if you belong to Christ [he is your father, you are spirit baptised, born again], you are really Abraham's seed, heirs with reference to a promise [the 3AC] (Galatians 3). Those in the 1AC are heirs of the FRC and of Jesus' validation sacrifice (Jesus' human body died when he was impaled. This death validated the 1AC and bisected it - see . They are heirs with reference to the 1AC promise, the first promise. Those in the LCC are heirs of the Abraham himself with reference to the land promise. Those in the 2AC are heirs of the CRC with reference to the second promise. Those in the 3AC are heirs of the ARC with reference to the third promise. Abraham�s �sons� through his 3rd covenant get the same blessing as Abraham himself got through his faith, namely they are living to God (i.e. they are dead to us but actually alive in angelic bodies but asleep awaiting a resurrection). Their angels look to God just like our children look to us in the middle of the night. For more on this - see Intro12. 38 He is a God, not of the dead, but of the living, for they are all living to him (Luke 20). All three are to be resurrected, because they are spiritually living to God (living as spirit creatures, living as sleeping angels), though physically dead to us. In summary, those who enter the first Abrahamic covenant, and remain in it, are declared righteous (in the flesh) by God, and so are resurrected, and this means that they gain citizenship of the Kingdom of God on earth. Those who enter the 2rd abrahamic covenant, and remain in it, are declared righteous in the flesh by God and gain citizenship of the kingdom of God on earth as priests. Those who enter the 3rd abrahamic covenant, and remain in it, are declared righteous in the spirit by God and have everlasting life. All of these sons of Abraham enter the Kingdom of God (whether in heaven or on earth) by resurrection. Even those who enter it through Armageddon get a living resurrection, in the form of the rapture of 1 Thessalonians 4, when they are converted into angels without dying, on the fly, as it were. So being resurrected is how one becomes a citizen of the kingdom of God. Now that we have all 4 Abrahamic covenants in perspective, we see that a son of the 1AC, 2AC or 3AC is just as much a son of Abraham as a son of the LCC was. Of course the former are sons by faith and the latter are sons by genetics. But all 4 are sons by covenant, and that is the big picture. So a 'Jew' today, taking the term' Jew' to mean true child of God, which means a true Christian, is still in fact a son of Abraham just as the original Jews were, but by Covenant. Le plus ca change the plus c'est la meme chose. 17 just as it is written: I have appointed you a father of many nations (Romans 4). This fatherhood is through the 1AC, the covenant of faith for us all. How does one enter into the First and the Second Abrahamic Covenants? 4 Then he went out from the land of the Chaldeans and took up residence in Haran. And from there, after his father died, [God] caused him to change his residence to this land in which you now dwell (Acts 7). 2 And Joshua went on to say to all the people: This is what Jehovah the God of Israel has said, It was on the other side of the River that your forefathers dwelt a long time ago, Terah the father of Abraham and the father of Nahor,and they used to serve other gods. 3 In time I took your forefather Abraham from the other side of the River and had him walk through all the land of Canaan and made his seed many. So I gave him Isaac (Joshua 24). 18 On that day Jehovah concluded with Abram a covenant, saying: To your seed I will give this land, from the river of Egypt to the great river, the river Euphrates (Genesis 15). So the river of Joshua 24 was the Euphrates, the northern boundary of the promised land. Symbolically we are being told by Abraham's actions that one enters the 1AC by crossing a river, which is the symbolism of baptism. But God did not conclude the LCC with Abraham until after he had entered Canaan. So he entered Canaan and he inaugurated the 1AC in uncircumcision. So he was walking by faith without being in any kind of true Abrahamic religion at that time. He was in fact in the true religion that had Melchizedek as its priest as can be seen from Genesis 14. 18 And Melchizedek, King of Salem, brought out the bread and wine, and he was priest of the Most High God. 19 Then he blessed him and said: Blessed be Abram of the Most High God. Producer of heaven and earth. 20 And blessed be the Most High God, who has delivered your oppressors into your hand! At that Abram gave him a tenth of everything (Genesis 14). Also we have no reason to believe that Abraham even got wet when he crossed the Euphrates. One imagines that he used a bridge or a boat for his household. So the 1AC is just entered into by having faith and permanently grasped by acting on that faith. This faith is not the faith of your homeland or of your relatives or of your father, it is your faith, a faith unique to you. Most people choose the religion of their nation, or of their relatives or of their father. The true son of Abraham under the 1AC, chooses the religion that he believes God is showing him. This does not have to be the true church in the case of the 1AC. Now John the baptist on the other hand baptised people into the 2AC, the true religion. These people were already genetic sons of Abraham and therefore in the LCC. 7 When he caught sight of many of the Pharisees and Sadducees coming to the baptism, he said to them: You offspring of vipers, who has intimated to you to flee from the coming wrath? 8 So then produce fruit that befits repentance. 9 And do not presume to say to yourselves, 'As a father we have Abraham.' For I say to you that God is able to raise up children to Abraham from these stones. 10 Already the axe is lying at the root of the trees; every tree, then, that does not produce fine fruit is to be cut down and thrown into the fire. whose sandals I am not fit to take off. That one will baptize you people with holy spirit and with fire (Matthew 3). 16 The Law and the Prophets were until John. From then on the kingdom of God is being declared as good news, and every sort of person is pressing forward toward it (Luke 16). 12 But from the days of John the Baptist until now the kingdom of the heavens is the goal toward which men press, and those pressing forward are seizing it (Matthew 11). So John was starting a process through which men press forward into the kingdom of God and eventually seize it. John was producing 'stones'. Stone make up a temple, a temple of true worship. So this process is the baptism into the 2AC, the Abrahamic Church Covenant, the ACC, and then the completion of the baptism, the sealing, which is in fact a righteous decree or declaration from God in the flesh - see [12,13]. Because the 2AC is the only way to get the blessing of Abraham (officially), which is citizenship of the Kingdom of God. John was in fact producing dead stones, judicially dead, because none of them had yet been born again. Later Jesus built another temple with living stones, those who had been born again. spiritual sacrifices acceptable to God through Jesus Christ (1 Peter 2). 14 For whenever people of the nations that do not have law do by nature the things of the law, these people, although not having law are a law to themselves. 15 They are the very ones who demonstrate the matter of the law to be written in their hearts, while their conscience is bearing witness with them and, between their own thoughts, they are being accused or even excused. 16 This will be in the day when God through Christ Jesus judges the secret things of mankind, according to the good news I declare (Romans 2). For more on the resurrection of the unrighteous see - Resurrection Timetables for the Kingdom of God. It is very important to realise that one does not have to join any religion in order to be saved by God. In fact more are saved who have never joined a true religion than are saved who have. This understanding destroys the Catholic and the Jehovah's Witness and many other religions' scare tactics that you will burn in hell (Catholic - although they are dropping this tactic presently), or at least not be resurrected (JW) if you do not join us! Lies, lies lies! What man is there who can restrict the mercy of God? However if you deny his existence then how are you entitled to his mercy? Those in the 1AC are not unrighteous, they are declared righteous as a result of their faith as Abraham was. The unrighteous ones are actually resurrected into Gehenna, the second death. The circumcised Jews in the LCC were automatically entered into the Second Abrahamic Covenant through the Law covenant at the passover in their 20th year once the promised land had been entered. Rather than being baptised in water, as a symbolic representation of being washed in the blood of Abraham, they were baptised with the blood of the passover lamb, one for each house, symbolically representing a washing with the blood of Moses. The priest for this baptism was the head of the household. Under law, having defiled one's flesh, i.e. broken one's baptism, one was washed again in the blood of Moses, which was symbolically represented through the blood of the animal that was sacrificed. John the baptist was achieving the same cleanliness through washing in water. Although both are just symbolic representations for a washing in the blood of a mediator, which is what a baptism is. John was actually washing people in the blood of Isaac, who was the validation sacrifice for the 1AC, Jehovah - Jireh (God will provide). He died of old age but was non adamic - see U506. John started baptising 4 years before the human blood of Jesus was available. Those who left Egypt aged 20 years old or more were baptised into Moses by means of the cloud and the sea, this was a baptism into the name of Father Abraham too, since the Law of Moses was a subcovenant of the ICC and the 2AC. But those who failed to keep the law, then fell out of the ACC. For a full explanation of this Chronology - see . The simplest way one can get to this date (that we are aware of) is by starting with either the date of the fall of Jerusalem to Nebuchadnezzar in the 19th year of his reign, which was 586 BC, a date which is relatively undisputed amongst historians - see , and counting back to the first year of Jehoiakim the king of Judah, which was 607. We then use Ezekiel's prophetic 390 year siege of Jerusalem in Ezekiel chapter 4 to count back to the last year of Solomon in 997 - see . 1 And it came about in the 480th year after the sons of Israel came out from the land of Egypt, in the 4th year, in the month of Ziv, that is, the second month, after Solomon became king over Israel, that he proceeded to build the house to Jehovah (1 Kings 6). So the 4th year of Solomon was the 480th after the Exodus, so 1033 was the 480th year after the exodus so 1513 was the zeroth year after the exodus which is the year of the exodus. From this we deduce the the original passover in Egypt, the last of the 10 plagues where the firstborn sons of every Egyptian man, and the firstborn or every beast of theirs died, was on 1513Nisan14 (30th March 1513 BC). (The passover is always on Nisan14, Nisan was is first month of the Hebrew year - see BLC). Actually it is quite amazing but the passover in the year 33 AD when Jesus died started at 6pm on March 31st Gregorian, and the BLC program can be up to 11 hours out in terms of Lunar phase data back at 1513 BC. It can be up to 15 hours out in 1943BC and up to 2� hours out in 33CE - http://sunearth.gsfc.nasa.gov/eclipse/phase. The new moon was at 16:46 GMT according to Fred Espinak of Nasa on March 30th Julian or March 16th Gregorian in 1513BC. If we move it forwards by 11 hours, then it would be at 3:46 on March 17th GMT or 5:46 Jerusalem Time, and 30 hours later is 11:46 am on March 18th, meaning that Nisan1 would start at 6pm on March 18th so Nisan14 would start at 6pm on March 31st. So it is possible that both passovers were on the same solar day (March 31st)! 17 Further, I say this: As to the covenant previously validated by God (LCC), the Law that has come into being 430 years later (430 years after the land promise of Genesis 12) does not invalidate it, so as to abolish the promise (Galatians 3). 24 And you must keep this thing as a regulation for you and your sons to time indefinite. 25 And it must occur that when you come into the land that Jehovah will give you, just as he has stated, then you must keep this service. 26 And it must occur that when your sons say to you: What does this service mean to you? 27 then you must say: It is the sacrifice of the passover to Jehovah, who passed over the houses of the sons of Israel in Egypt when he plagued the Egyptians, but he delivered our houses. Then the people bowed low and prostrated themselves (Exodus 12). 40 And the dwelling of the sons of Israel who had dwelt in Egypt was 430 years. 41 And it came about at the end of the 430 years, it even came about on this very day, that all the armies of Jehovah went out of the land of Egypt (Exodus 12). 2 And Joshua went on to say to all the people: This is what Jehovah the God of Israel has said, It was on the other side of the River that your forefathers dwelt a long time ago, Terah the father of Abraham and the father of Nahor, and they used to serve other gods. For more on this - see . 1943Nisan14 was April 10th 1943 BC. 3 From the 13th year of Josiah the son of Amon, the king of Judah, and down to this day, these 23 years the word of Jehovah has occurred to me, and I kept speaking to you people, rising up early and speaking, but you did not listen (Jeremiah 25). 8 years old was Josiah when he began to reign, and for 31 years he reigned in Jerusalem (2 Kings 22:1). Or we can count back through the kings to Solomon starting from the date of the fall of Samaria to Shalmanezer, known by historians (Cambridge Ancient History) to be in the year 723Nisan to 722Nisan. of the holy place (Leviticus 4). 17 And the priest must dip his finger into some of the blood and spatter it 7 times before Jehovah in front of the curtain (Leviticus 4). 20 which he inaugurated for us as a new and living way through the curtain, that is, his flesh (Hebrews 10). The Angelic covenant system mediator always seems to be possessed by Gabriel. Melchizedek in his various incarnations is never a validation sacrifice (other than in Jared) because after Jared he just pops across from Eden2 and then goes back there - see U54. Jared's human body for the FRC and Methuselah's human body for the CRC were sealing covenants. Abraham gave Melchizedek a 10th of all things because the 2AC gives a 10th of mankind to the King of the Kingdom of God, the King of Peace, Melchizedek. The Bread and Wine were for the 1AC, the FRC, because the 2AC was not promised until Genesis 18. Melchizedek is said to have blessed Abraham and God and really everything except the bread and wine. But since he brought them out and since he was the priest, he would have blessed them too. The two of them celebrated the 1AC with all those present. This would have been done on Nisan14, for as we shall see in U15 Jesus celebrated the 1AC at the last supper. Abraham could take these emblems even though Jesus had not died yet, since the apostles also ate this bread and drank this wine before he died at the last supper and in theory at least he might have failed the test. Does a saint living after Jesus had come to Israel on 29Tishri10 have to put faith in Jesus before he can be sanctified? 15 But I said, 'Who are you, Lord?' And the Lord said, 'I am Jesus, whom you are persecuting. So YES. That is why Peter had to meet him before he could be sanctified. Incidentally the 6 water jars into wine at Cana are those in the 2AC subcovenants of Isaac, Moses, and the 4 Elijah's. FRC and CRC are the righteous decree in the flesh, the ARC is the righteous decree in the spirit (everlasting life). 23 Not only that, but we ourselves also who have the firstfruits, namely, the spirit, yes, we ourselves groan within ourselves, while we are earnestly waiting for adoption as sons, the release from our bodies by ransom [an angelic ransom actually of the associated angel of John the baptist, the validation sacrifice of the JAC for Jacob] (Romans 8). 14 how much more will the blood of the Christ [the blood of the ARC], who through an everlasting spirit offered himself without blemish to God, cleanse our consciences from dead works that we may render sacred service to [the] living God? 15 So that is why he is a mediator of a new covenant, in order that, because a death [of John the Baptist as a human, the mediator of the 1EC and the seemingly unnecessary validation sacrifice for the ICC] has occurred for [their] release by ransom [of Isaac] from the transgressions [not of the conscience but of the flesh] under the former covenant [the law subcovenant of the ICC], the ones who have been called [into the 1NC subcovenant of the JAC] might receive the promise of the everlasting inheritance [this being the promise of the ARC] (Hebrews 9). Jesus died to give everlasting life to Adam, so his Master Covenant imparts everlasting life and so entrance into it is the end of the test that a sanctified Christian undergoes.